This is a most powerful Islamic Occult Love Spell, which uses the hair of the yearned for lover and a special Muslim Shabar Vidya Naqsh to entice the desired lover to reciprocate the love and affection of the practitioner of this Vashikaran Voodoo Spell and win the love and heart of the lover for the purpose of love or marriage. 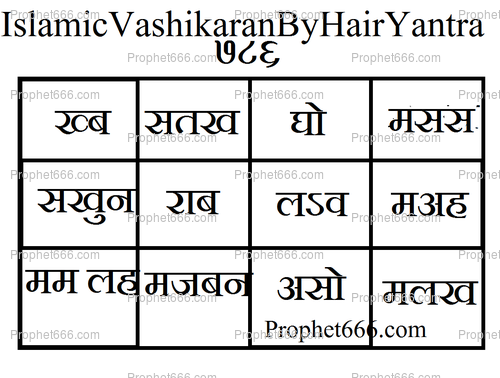 In this post, I have described the simple method of making and using this Vashikaran Yantra for the purpose, which, I have mentioned. The Yantra, which, I have given in the image, should be prepared by drawing it on white paper using black colored ink. Then it should be wrapped in the hair for the hankered after lover, for this purpose some hair of the desired lover, the practitioner is desperate for, should be procured. The hair of the desired lover is essential to this Love Vashikaran Experiment without, which this Vashikaran Tantra cannot be performed. The Vashikaran Experiment can be performed on any day and can be performed by both men and woman to put a spell on their desired lover. The Tantra mentions that this Vashikaran Experiment will be successful after within a period of 7 days. Nevertheless, it would be most appropriate to mention that, I have not witnessed it been tried and tested by anyone to win over their desired life partner. As long as the hair belongs to the person sought to be attracted, it is ok.
if yes, kindly guide me.. Wrapped hair in the yantra or wrapped around the foleded yantra? Also what yo do with that yantr? Keeping in pocket? No need to write name on yantra? See the answer to the comment below. There is no need to write the name of the person sought to be attracted on the Yantra and it should be kept in the pocket, purse or anywhere on the body. 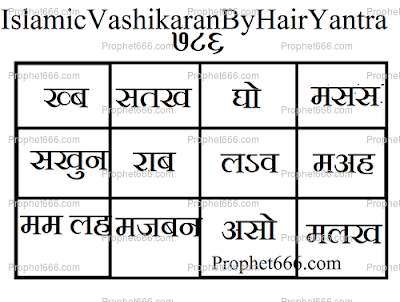 As mentioned in the article the hair of the desired lover is essential for performing this Yantra Experiment, without, which it cannot be performed. The paper yantra has to be wrapped by the hair or the hair has to b kept inside the yantra and then fold the yantra. And the next thing, how long does th yantra ha to.be kept in possession. What to do after seven days. How long the yantra had to be kept in possession. The Yantra should be folded and wrapped inside the hair of the desired lover. The Yantra can be kept in possession for at least 14 days. how can I wrap folded yantra with men's hair as men hair is very short and not able to wrap with too short piece of hair? can I place men hair inside the paper and fold it? or can I stick small hair around the folded paper with glue? Please clear my doubt sir, how to wrap with male hair as it is too short to wrap around the folded yantra? You can prepare a small Yantra and wrap it in the hair of the man as that is what is exactly prescribed in this Vashikaran Tantra. Can we keep that yantra inside our purse or must in pocket?? Has this mantra worked for anyone? If you have success story, please share it with us all. Thanks. I have done it a few days back. on July 9th 2017.. Waiting for success as of now. Will DEFINITELY post if something good materializes.